Gadhimai Festival is held every 5 years in the Gadhimai Temple. This temple is located in Bariyapur which lies in Bara District which is about 100 miles or 160 kilo meters from Kathmandu Valley. It is located in the southern part of Nepal. This part borders India because it lies near to Bihar. That is why, both Indians and Nepalese from both the countries visit this temple and offer such sacrifices. Both Bihari people from India and Madhesis from Nepal observe this festival by performing sacrifices of animals like water buffaloes, goats, chickens, pigs and pigeons. By doing this, it is believed that the Gadhimai Goddess will be pleased and will shower everyone involved with her blessings. Gadhimai is the goddess of power. The origin of this festival dates back to 265 years. According to Hindu mythology, a feudal landlord was sleeping in a prison where he dreamt that he would be freed from all the worldly sufferings if he is able to make a blood sacrifice to Gadhimai Goddess who is the goddess of power. The Goddess has been said to have asked for human sacrifice in fact. But BhagwanChowdhary successfully offered her the blood of an animal instead which was accepted by the Goodess. Ever since, this ritual has been going on. This sacrifice goes in such a large scale that an estimated 500,000 animals are sacrificed every time. In the year 2009, it was counted upto 500,000 animals that were slaughtered in this place for the purpose of pleasing the Goddess. The scale of slaughter and sacrifice looks so massive and grim that many social activists had been raising voices against this tradition. Finally, in the year 2015, the government legally prohibited such large scale sacrifice of animals during the Gadhimai Festival. The worst killings area unit those of Panchhbali – 5 offerings – within which the throats of 5 varieties of animals (buffaloes, goats, pigs, roosters and rats) are slit with a knife.it’s not done quickly. The animals die a slow, very cruel, killing whereas the monks sprinkle the blood across the idol and its surroundings. Right when the panchhbali, it’s the buffaloes’ turn. Wielding swords, men enter a enclosed yard wherever around 20,000 buffaloes are kept, and begin hacking at the buffaloes’ necks. because the killers cannot come off the buffaloes’ heads directly, they initial cut the hind legs. when the animal falls on the bottom the lads hack till the buffalo’s head is separated from the body. It takes up to twenty 5 tries to kill a giant buffalo. The suffering is unthinkable. Animal sacrifice edges the community concerned in fairs like Gadhimai. This year the organizing committee expects to lift concerning a pair of million euros from marketing animal hides and carcasses additionally as payment for provision and recreational facilities. In distinction, the poor don’t move out of it. Some can need to pay up to 2 months’ wage to shop for AN animal to be sacrificed at the truthful. During this festival, almost 4 million people both from Nepal and India participate to observe it. The sacrifice is supposed to end evil in order to bring prosperity. This is believed by the individuals who take part in this festival. This concept is so prevalent in the people who observe this ritual that they do not want to stop it even though the country and the legal system had banned it. Find here 11 facts about Gadhimai festival of Nepal. Here we have posted some interesting, amazing and some are disgusting facts about this Gadhimai mela. Things to do in Gadhimai festival of Nepal in 2014 is stop the animal sacrifice. There had always been a lot of objections and controversies surrounding this festival. Many animal rights activists and Hindus from the hilly region of Nepal objected to such inhuman behavior in such grand scale. For a long time, different local, national and international organizations including popular activists openly objected to this ritual and brought the issue to the government in order to stop it. But, it was not taken into consideration by the government. Because it is a centuries old tradition and interfering with it would cause a lot of havoc among the madhesi community. Ram BahadurBomjon, who has been claimed to have been the reincarnation of Lord Buddha also said that he would attempt to stop this sacrificial ritual. Buddhism as it is is completely against any kind of violence and killing such innocent animals in the name of sacrifice is a very inhuman ritual even to a layman’s mind. Finally, in 2014, a ray of hope came across as GauriMaulekhi a trustee from Human Society Internation filed a petition to stop the transportation of animals from India to Nepal in order to sacrifice. As a result the government of India did pass an interim order to prevent the transportation of animals from India to Nepal for such sacrifice. The supreme court of India took this action and also give directions to local bodies that these rules are implemented in proper way. That time, NG Jayasimha, HIS India’s MD also visited Nepal to ensure that the ban has been implemented properly. Finally, in July 28 2015, the Government of India as well as Nepal banned this festival. However, the Gadhimai Trust, which is an official entity of Gadhimai claim that they will not stop the festival and will not stop the sacrifice too. The scale of sacrifice that has been seen in this festival is heart wrenching to watch for any animal lover who wants the welfare of the animals. IF we look at the pictures from the festival where sacrifice takes place, it looks really scary because so many animals are killed out in the open. On top of that, the hides and heads and every unwanted things that are remained in the area after the sacrifice cause a lot of problem in the environment. The smell is very bad and because of that, there are also chances that different diseases will spread because of such sacrifices. Lack of proper hygiene and lack of any proper law while implementing and executing such sacrifices cause a lot of problem in the community that is living around the temple. Different diseases spread to the community as a result of which, the local people have to compromise on their health. Also, because such large scale of sacrifice, the shortage of animals have been a prominent issue in Nepal as well as India. In the year 2014, it has been reported that 250,000 buffaloes, goats and chicken were decapitated. This festival is majorly celebrated by Indians who travel all the way to Nepal to observe this ritual. It is reported that five million people celebrate this festival out of which 80 percentage are Indians. To observe this two day event, they travel all the way to Nepal. Officially, this 265 year old ritual has been cancelled by both the governments of Nepal and India including the chairman of Gadhimai Temple Trust. Such rituals are not only scary to watch but also inhuman in many levels. The innocent animals that are sacrificed in the name of religion is not a fair thing to do. Such animals haven’t harmed the humans nor have they caused any problems. In the society of today where we are so much modernized, it is not a good tradition or ritual to continue. Of course, it must have been a good thing back then in the times like a hundred years ago because at that time it had not gone upto this scale. But now, the sheer number of sacrifices that are being made is scary. It not only raises questions about the human thinking but also questions why it has been going on in today’s time as well. Such tradition needs to be stopped as soon as possible because what we do now will be repeated by our coming generations. And the generations that are yet to come they do not need to bear testimony to such inhuman practices. They can instead be given teachings on how to love each and every animal lives that live around us. Killing any other animal in the name of pleasing a Goddess which was claimed by some person hundreds of years ago is not a good practice. There are no evidence to the fact that such sacrifices would in fact make any difference in the living conditions of the people who participate in it. It is the lack of education that has caused such tradition to go on and on for years and years in the history. The uneducated and innocent people of these regions have been brought up in such tradition and as a result they also start believing the same. So, it is the religious leaders who should make the people understand that it is not a good thing to follow. They need not completely stop celebrating the ritual but, such cruelty can be abolished as it is the demand of the changing times. The dimensions of sacrifice that has been visible in this festival is heart wrenching to watch for any animal lover who desires the welfare of the animals. IF we examine the photos wherein sacrifice takes area, it seems actually frightening because such a lot of animals are killed out within the open. On pinnacle of that, the hides and heads and every unwanted matters which are remained inside the area after the sacrifice cause numerous hassle inside the environment. This could be very bad and due to that, there are also probabilities that distinctive diseases will spread due to such sacrifices. Loss of right hygiene and absence of any proper law at the same time as imposing and executing such sacrifices motive a variety of problem inside the community that is living across the temple.special sicknesses spread to the network due to which, the local people should compromise on their health. additionally, due to the fact such huge scale of sacrifice, the dearth of animals were a prominent problem in Nepal in addition to India. In fact, it is a very old controversy among meat eaters and non eaters. However, we can all agree to the fact that in order to appease Gods and to satisfy our hunger, we need not make such a grim and scary spectacle of mass sacrifices. It can be conducted in a lower scale and in better conditions so that children and those who watch it won’t be scarred for life. It is definitely a sign of good cultural status that Nepal completely banned this inhuman and ruthless ritual where so many innocent animals are sacrificed for selfish reasons. 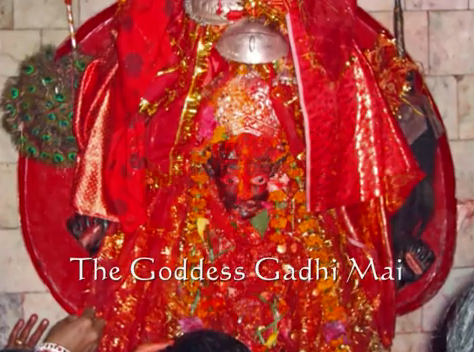 The goddess of Gadhi Mai is believed to have seven sisters, namely Gadhi Mai, Virta Mai (Birganj), Boudhi Mai (Madhuwan, Bara), Sansari Mai (Shiva Nagar, Pothiyahi), Kanhar Mai (Sameera Bagadh) and Ghodashi Mai (Dharampur, Rautahat district). Every five years these seven sisters assemble in one place on the auspicious occasion of the Gadhi Mai fair. The Bariyarpur village becomes the marvellous scenic spot for animal sacrifice. This fair provides a national and international forum for fraternity, brotherhood and mutual understanding among the devotees visiting it. This fair lasts for twenty days. As we know that sacrificing animal is not things to do. But this is things to do in Gadhimai festival of Nepal. which is not good. We should stop the animal sacrifice. 1. More than two lakh fifty thousands (250,000) animals (buffalo, goats, chickens and pigs) are killed in this festival (mela). It is supposed that last festival which was held in 2009, November, approx. 500,000 animals were sacrificed in 2009. More than 20,000 buffaloes were killed on the 1st day. 2. Gadhimai festival is held every five years at the end of month November. And this year 2014 is now turned; going to be held. It lasts one month during the November. So, Gadhimai festival Nepal 2014 is going to be held in this November. 3. These all 500,000 animals are sacrificed in the name Hindu goddess Gadhimai to praise her. It is believed that Goddess Gadhimai is pleased by the animal sacrifice. 4. All those slaughtered animals are taken to nearby villages and small town and eaten in the feasts by the devotees. 5. Gadhimai festival is celebrated by the Nepal. This festival is dedicated to Gadhimai temple. For you kind information, Gadhimai temple is located in Bariyarpur village in Bara District. This village, Bariyarpur, Bara is about 100 miles (160 km) far from the Kathmandu, capital of Nepal. This temple is south of the Kathmandu valley in Terai region. 6. Gadhimai festival is supposed as the festival of world’s largest sacrificial slaughter of animals. Animals may be buffaloes, pigs, goats, chicken and pigeons. 7. The main goal of devotees is to please the Goddess Gadhimai Devi. She is supposed the goddess of power in Hindu religion. Participants believe that animal sacrifices will end the evil and bring prosperity in their life. 8. During the November month, there are huge crowed of devotees and animals in this area. It is estimated that more than 5 million people from all over the Nepal and some southern states (Uttar Pradesh and Bihar) of India participate in the festival. 9. Majority of people who have gone there for animal sacrifice are Madheshi or terai. People from the Indian states of Uttar Pradesh and Bihar also use to come here form animal sacrifice. 10. There are more than 200 men to kill the animals in a concrete slaughterhouse near the Gadhimai temple. 10+1. After the festival is ended, companies in India and Nepal buy all the meats and bones of animals. (1) THIS IS THE WORST EVENT HAPPENING IN THE NAME OF A GODDESS BY HUMANS TO FULFILL THEIR WORLDLY DESIRES. ACCORDING TO MYTHOLOGY YOU CAN SACRIFICE ANY LIVING BEING ONLY IF YOU HAVE ACQUIRED THE POWER TO MAKE THAT BEING AGAIN ALIVE. IT IS NOT POSSIBLE BY THOSE WHO ARE SLAUGHTERING BEINGS TO GADHIMAI. I HAVE WRITTEN TO TOO MANY PERSONALITIES WHO CLAIM TO PROTECT COWS AND ANIMALS AND GIVE GREAT SERMONS ON SANSKAR AND OTHER RELIGIOUS DISCOURSES AND KATHAS BUT THEY DO NOT RESPOND AT ALL TO SUCH A ISSUE WHICH IS MUCH RELATED TO HUMAN MIND AND SOUL. (2) ANOTHER HEINOUS ACT IS TO GIVE OXYTOCIN INJECTION TO MILKING COWS AND BUFFALOWS. INSTEAD OF BEARING PAIN OF ONE TIME KILLING, THE ANIMALS SUFFER A DAILY TORTURE AND IT REDUCES THEIR LIFE TOO. THE HUMANS WHO TAKE MILK OF COWS AND BUFLLOWS GIVEN OXYTOCIN INJECTION GET LOT OF DISEASES. WE ARE TOO CARELESS TO SUCH GREAT ISSUES. I WROTE TO 90 NGOS OF NEPAL ABOUT SLAUGHTER FOR GADHIMAI FESTIVAL, NONE REPLIED OR SHOWED ANY INTEREST IN THIS MATTER. I FEEL TOO MUCH SORROW AND PAIN FOR THIS EVENT HAPPENING. I am agree with you… I wanted to read about the recent earthquake in Nepal and i found this horrible images that hurt my soul so much…. And I can not bealive such a horrible human mind??? They are so insaine minds, and to say that they believe that animal sacrifices will end the evil and bring prosperity in their life, it is a such a stupid way to see life!!!!!! I am so upset, sad and crazy…. What i can do??? what the hell happening there man.How cruel people are becoming.Did mataji asked for bali of buffalaoes .How can they do that.Now at present Our India is biggest exporter of milk in the world.If this will happen people will drink blood instead of milk.Really yaar it’s really horrible getting tears seeing this.Thank god it has been banned by govt .But I still don’t understand how Nepal govt gave permission to happen such till now.please yaar love animals.